This week, I baked Yankee Magazine’s Maple Walnut Muffins (recipe at link). As always, I adapted the recipe to suit my taste and pantry. I replaced the (white) all-purpose flour with white whole wheat flour. I reduced the amount of maple syrup, from 3/4 cup down to 1/2 cup. Instead of 1 cup sour cream, I used 1/3 cup nonfat Greek yogurt and 2/3 cup sour cream. I did not do the optional dip of the finished muffins in maple syrup and confectioner’s sugar. I love how the texture turned out with white whole wheat flour. I think this maybe the first time I’ve done a straight 1 to 1 substitution in a recipe. The muffins didn’t seem overly “wheaty” or heavy. I also found them nicely (lightly) sweet with just the 1/2 cup of maple syrup; I think the full 3/4 cup amount would’ve been cloying. My one note is that I didn’t find them particularly maple-y though. I don’t believe increasingly the maple syrup to the full amount would’ve made a substantial difference. Maybe the addition of maple extract would help? I would also like to experiment with reducing the fat a bit. I’ve had good luck substituting unsweetened apple sauce for a portion of the butter in other muffin recipes, and might also try doing a full 1 to 1 substitution of nonfat Greek yogurt for the (full fat) sour cream. Lastly, I felt the recipe may employ a tad too much baking soda. A tablespoon of leavening (total) for a 12-muffin recipe seems a little bit excessive to me. The muffins did have a touch of that distinctive bitter, slightly metallic baking soda flavor to them. It’s hard to describe but if you’ve ever tasted it, it’s easily detectable forever after. Not a disappointment by any stretch of the imagination — they just need a little more tweaking! 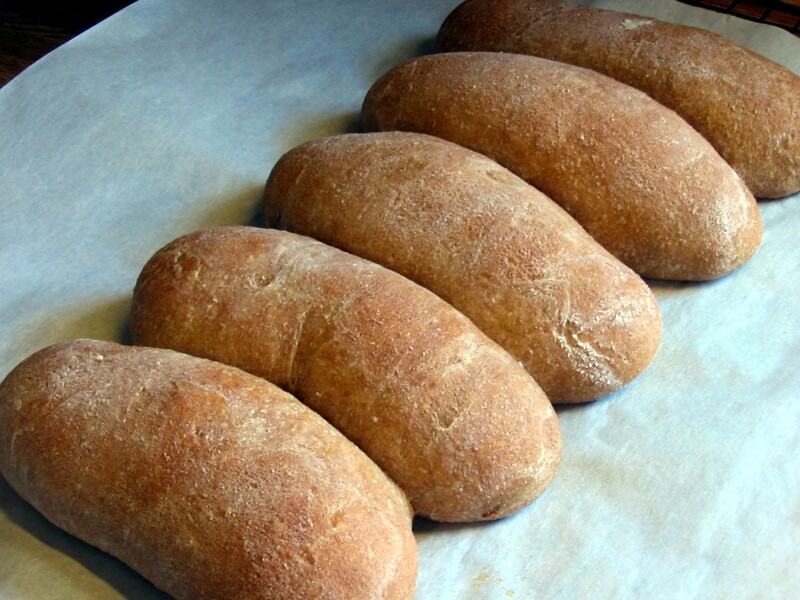 the easiest whole-wheat bread ever? I was really intrigued by this recipe from King Arthur Flour Whole Grains Baking. The dough isn’t kneaded; rather the ingredients are mixed into a batter which is proofed in a loaf pan for an hour and then baked. The instructions seemed so avant garde — when have I ever gone from mixing ingredients to oven-ready loaf in just an hour?! I suppose I shouldn’t have been surprised that it turned out kind of… ummm… flat. I later found the recipe posted on King Arthur Flour’s site (renamed “No-Knead 100% Whole Wheat Bread“), now with more extensive proofing instructions. Apparently, I should have let if proof slightly longer, although I doubt another 30 minutes would have made much of a difference — my bread barely rose at all in 60 minutes (this was as expected, according to the book instructions). If only I had done a little more research — but sometimes I just want to bake without overthinking things, ya know? Appearances aside, the bread is soft and moist, and the flavor of the molasses really shines. It toasts up beautifully too! I refreshed my still-kickin’ sourdough starter to make this whole grain sourdough bread yesterday. In addition to the whole wheat flour, I added brown rice and oats to the dough, which resulted in a moist and very flavorful bread. My only complaint was that where some of the brown rice made contact with the hot baking stone, those rice bits became very hard, so some mouthfuls of bread had a little painful surprise when you bit down. No idea why this happened, because I didn’t have this problem with earlier loaves containing brown rice. OK — I do realize it seems a bit hypocritical to be making whole grain buns only to put a whole-fat, highly-processed, chemical-laden meat product in them. But dietary improvements are best made gradually, yes? 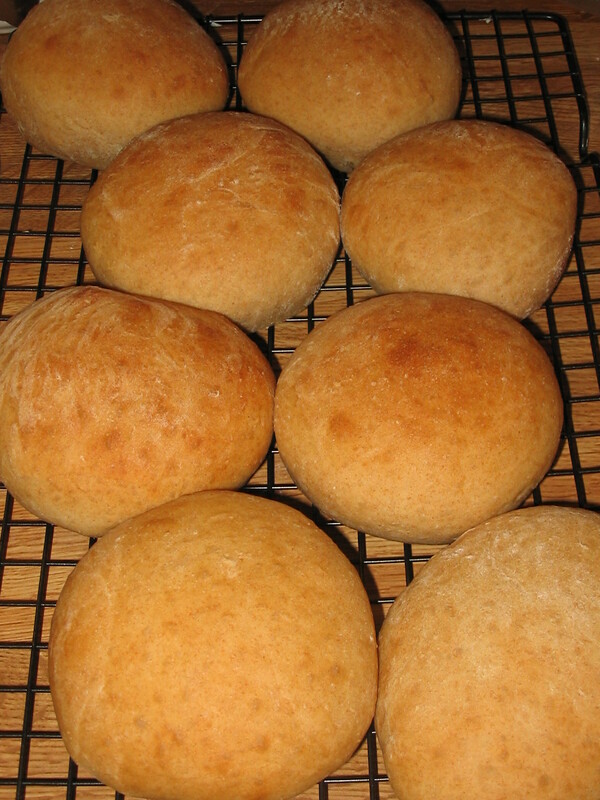 I took some of the dough from yesterday’s whole wheat bread and shaped them into hot dog buns. They came out really well, if a bit irregular — it adds to their charm, I think. And now I can feel a little better about my family eating hot dogs for dinner while I go out to eat with my book club (they’re not complaining). We are solidly a whole wheat bread family when it comes to store-bought breads. I freely admit that white bread makes the best toast and grilled cheeses so occasionally we will get Scali Bread for a treat, but I really prefer to stick to whole wheat for our daily bread. But when it comes to homemade bread, I’ve always been somewhat reluctant to bake whole wheat bread — whole wheat always conjures up images of dense, leaden, inedible bread to me. I know I’m not the only one who feels this way or else why were whole grain breads given a bad rap for such a long time. Yesterday I baked a 100% whole wheat (yes, that’s all whole wheat flour — no white flour at all) sandwich bread which might make me a homemade wheat bread convert. 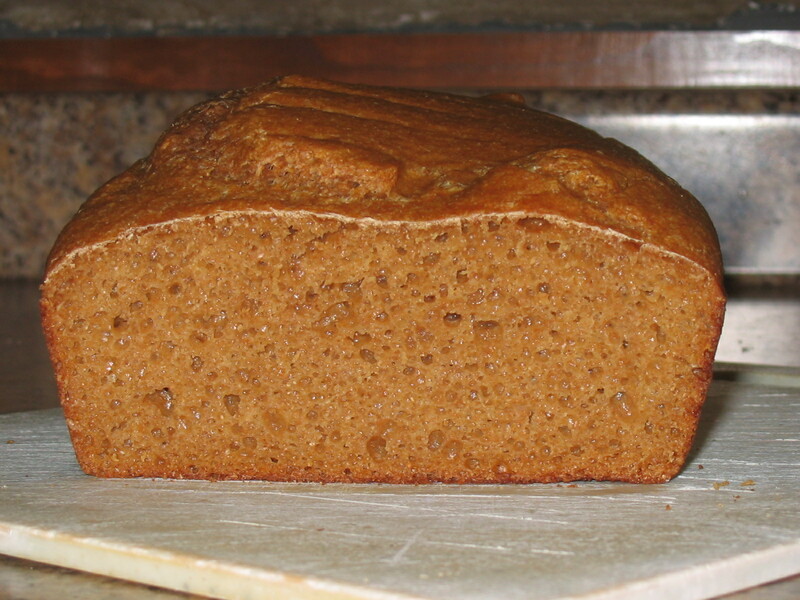 It’s moist and light(ish — it IS whole wheat after all) and the crumb is small and even but not at all dense. Hopefully even C. (my biggest white bread connoisseur) will feel the same way about it. Now if only I can figure out how to make good homemade double fiber bread! First of all, I must give props to P. who came to the rescue and did most of the work making these buns when I sliced my fingertip this morning and had to go to the ER to have it glued back together. This is the same King Arthur Flour recipe I made back in June except I replaced a cup of the all-purpose flour with whole wheat flour. They went great with P.’s hand-shaped burgers and hand-cut sweet potato fries! Boulangerie Poilâne is a Parisian bakery, founded in 1932 by Pierre Poilâne. It is most famous for its huge miches (or large boules). What makes Poilâne’s miches distinctive is that they are sourdough loaves made using stone-ground wheat flour and sea salt from Guérande and are baked in a wood-fired oven. You can actually mail order a Miche Poilâne direct from the bakery to the U.S. for about $48. 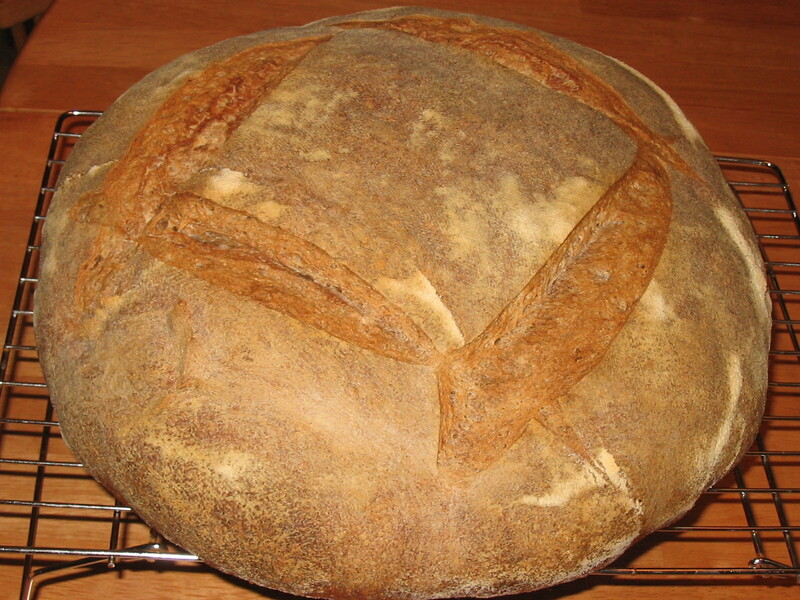 A Poilâne-style miche is featured on the cover of Peter Reinhart’s Bread Baker’s Apprentice. These facts notwithstanding, the primary reason I decided to bake the Poilâne-style Miche from the Bread Baker’s Apprentice was because I had to feed my existing sourdough starter and I didn’t want to discard the remaining 7 ounces of old starter. 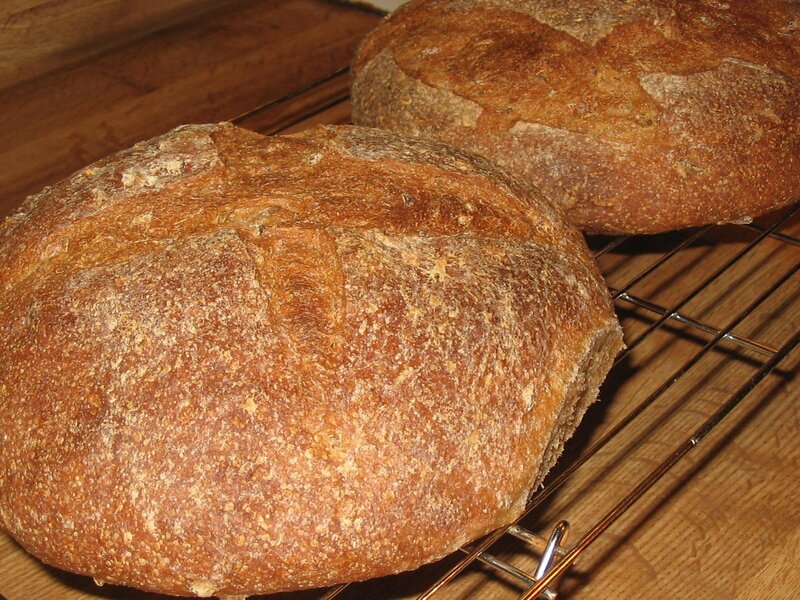 And as luck would have it, the Poilâne-style Miche uses exactly 7 ounces! I actually set out to make petit pains Poilâne — smaller boules — because Peter had noted in the book that many testers felt the full-sized miche was a bit unwieldy. However, making multiple, albeit smaller, loaves would’ve required more available space in my refrigerator (the loaves have to be retarded overnight in bannetons, or proofing bowls, in order to keep their shape). A single giant bowl takes up less fridge real estate than two or three large bowls, so a giant miche it would have to be. Making the miche was a three-day affair. The first day, I mixed the starter (using the sourdough starter, flour and water). 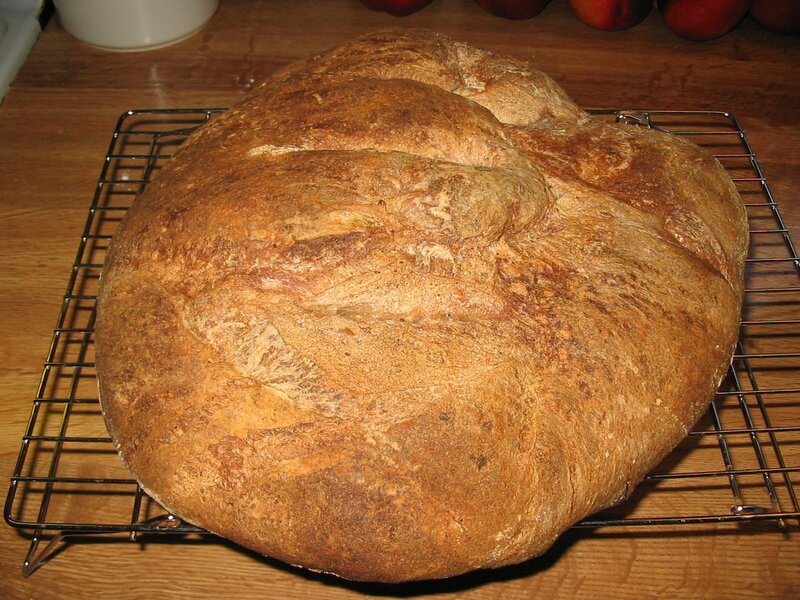 The second day, the starter was added to the remaining ingredients, resulting in a monster of a dough. The dough is actually too large to be mixed in a stand mixer at this point so it has to be hand-kneaded for 10 to 15 minutes. I haven’t hand-kneaded anything for more than a couple of minutes since I got my stand mixer last fall, and let me tell you, it’s a workout. Time never moves as slowly as when you’re vigorously kneading a gigantic five-pound mass of dough. But… it is a really nice dough to work with — slightly sticky — and I had forgotten the sensation of feeling a dough take shape beneath your hands. You can actually feel the dough transition and the gluten do its thing as you knead it. I knew this was true intuitively (it’s why many bakers eschew the use of stand mixers and other gadgets and work their dough by hand), but I really needed to experience it again to remember. Anyone who knows me well knows two basic facts about me: 1) I don’t like to waste food, and 2) I have a big sweet tooth. Another fact: I haven’t baked anything from a box in quite awhile. But going through my baking stash the other day, I came across a boxed gingerbread mix I received last Christmas. As I said, mixes aren’t my thing these days, and I would’ve donated it to the local food pantry if only I could’ve checked the sell-by date (I couldn’t find one) on the box. Given that the ingredients were flour, brown sugar, molasses and spices, I felt safe making it for our consumption though. I’ve made gingerbread from scratch many times so I feel reasonably assured I know what it’s supposed to taste like. The fact that the mix was made with whole wheat flour should’ve raised some mighty big red flags, but I felt hopeful. I mean, it had molasses, brown sugar and spices in it, right? How bad could it be? Yuck. Yuck, yuck, yuck, yuck, yuck. Why is it doughy? Why is it salty? Why is there no discernible sweetness at all? And what is that weird aftertaste? My sweet tooth aside — it is truly devoid of sweetness. I wasn’t even planning on baking gingerbread cookies this Christmas but now I almost feel have to if only to remind myself how good it can be. Why is this cookie so angry? Because no amount of royal icing can make him sweet. Since it appears as though any kind of sourdough creation is going to be later rather than sooner for me, I decided to make the Rustic Country Bread found on the Cook’s Illustrated website. I liked this one because it had a hand-mixed variation, which is particularly important since I don’t yet own a stand mixer. 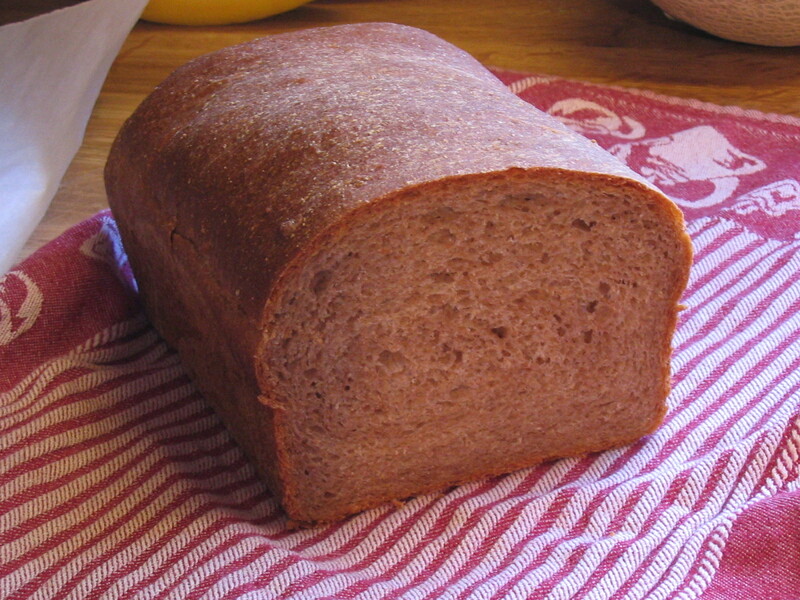 The bread was primarily made with white bread flour, with some whole wheat and rye flours too. I wasn’t sure how this was going to fly with C., the committed white foodatarian. He wasn’t ecstatic, but he did try some after liberally buttering both sides of a slice. Those of us who are not as bound to white flour thought it was really tasty and not excessively whole-grainy. I’m dying to try the Rustic Italian Bread on the CI site too but it’s going to have to wait for that darn stand mixer.